Following the battle against the Orgmencreatures transformed by the mysterious drug, SEEDMika Asagi has tracked the manufacturing of the narcotic (along with a whole new Orgman infestation) to South City. In Gungrave VR, players take control of Grave with his iconic set of dual guns, Cerberus, and will have to master different playstyles to take down the various foes that stand in his way. Levels consist either of free-moving third-person gameplay or first-person action that includes both stationary and mobile sections, offering players a variety of modes to help put them in the shoes of the resurrected Millennion agent himself. 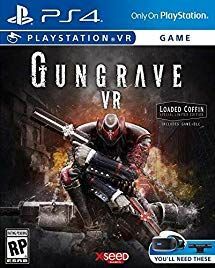 With an array of shooting attacks, close-range strikes using Grave's coffin, Bullet Time, and more, Gungrave VR brings an authentic Gungrave experience to virtual reality for the very first time.